Hey lovebugs! Happy hump day! We're getting there! 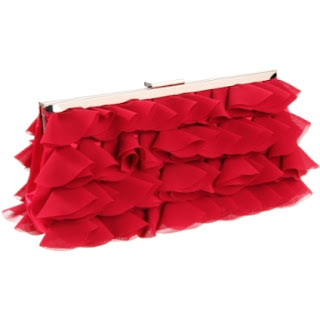 I love a great girly clutch and today we're looking a great red clutches with some extra flare. These bags have fantastic ruffle details that add an extra bit of interest to an otherwise small piece. I'm obsessed with this bag. It's a great night out bag and the color options to choose from are endless. These great petals remind me of the cherry blossom petals here in DC. The bow is a great touch. I really like the square look of this clutch and gold touches are really special. This clutch reminds me of the bottom of a great skirt. This playful layering of fabric is fun and flippy. Sometimes a sleek patent leather clutch is what an outfit calls for; but sometimes go for something a little more whimsical. That first one definitely speaks to me!